2011 was a year of discovery for me. 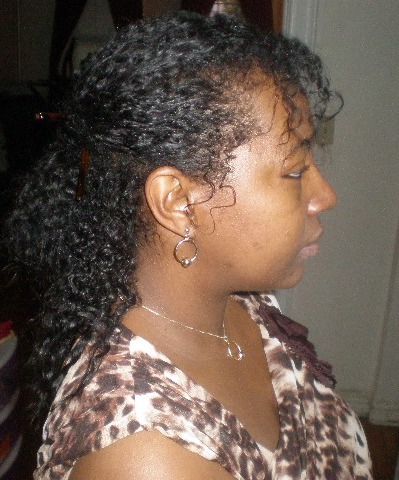 When I was relaxed, my hair was a slave to the flat iron. When I went natural, I did very little to change my habits of styling initially. I had been natural for about 6+ years (give or take a few months) yet I still knew little about how to care for my natural curls so I was at an impasse until I discovered The Tightly Curly Method (more on that later). Using direct heat on my fine natural hair has never been a good thing for me. I didn’t do it often. Instead I’d occasionally opt for indirect heat via the blow dryer. I knew so little about how to “tame” my natural hair so I thought my only recourse was to keep it straight and I did that mostly by pulling my hair into a ponytail while it was still wet. When I rarely use direct heat to style, I would use a ceramic tourmaline ionic (a lot of words to do a lot of nothing) flat iron, including the InStyler. Oh, and then there was the MaxiGlyde once upon a time ago but that lasted less than a year before it malfunctioned after only a few uses. A few times when I wasn’t up to styling my own hair, I let the Dominicans have a go at it. They blew my hair with the hottest hair dryers on the planet. It’s a wonder I still have skin left on my scalp or any hair at all. It’s shocking that there was little to no damage but in my estimation, it’s because they weren’t using direct heat contact with my fine strands. The crazy thing is before any form of heat styling, my hair was prone to being straight in some parts of my head. That’s mainly due to the natural inconsistency of my curl pattern (different curl types all over my head….3C, 4A and a little 3B). Constantly pulling my hair straight in ponytails (mostly when wet) made it all worst. The constantly pulling of my hair into these tight ponytails did more damage to the texture of my hair than the “blue moon” heat styling. While my texture seemed to be the biggest culprit to the way my hair looked when styled, in April of 2011 I noticed that the hair at the crown of my head had broken almost down to the root! This was a shocking and alarming wake up call. I had to find a new way to style my hair that didn’t involve pulling it straight or using heat (even occasionally) and I needed to find it fast. My research began online (you know you can find virtually anything on the internet). 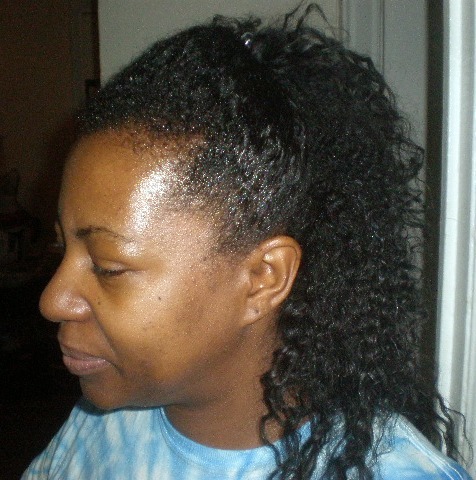 I was led to websites like Youtube, CurlyNikki.com, and NaturallyCurly.com. While each of these sites have been helpful at getting me to understand my curly wavy hair, I still felt like I was missing something. I became a product junkie and repeatedly tried methods that resulted in fabulous results for others but just OK for me. After repeatedly trying twist outs, braid outs, flexi rod sets and other methods to style my fine natural hair, I was still left with inconsistent curls. The closest method to reviving my curls naturally was using Zizyphus. 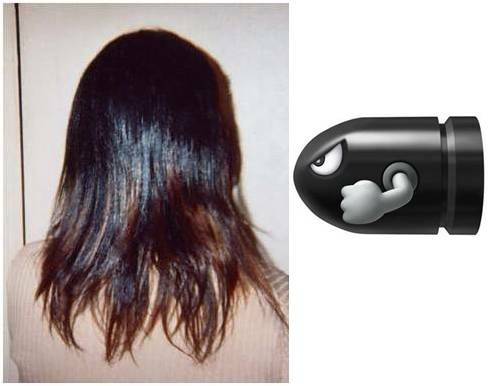 I continued to use it because it made my hair appear quite dense. Yet, styling my curly hair with little effort is what I was in search of. Fast forward to October of the same year and I discovered a book, Curly Like Me: How to Grow Your Hair Healthy, Long, and Strong by Teri LaFlesh. I’d read many hair books and articles but something in me just had to read this book by Teri. I think it was because of the picture on the cover of the book depicting how long Teri’s hair was. After reading the summary of Teri’s hair story, I figured the book would share the “magic bullet” to help me better care for my own hair. Teri’s method of defining your curls is simple. So simple I figured there’s no way it would work for me. She’s half white so admittedly I wasn’t confident that this method would work for my hair. Still, I decided to try. What’s the worst that could happen? After cleansing your scalp with a gentle shampoo, rinse your hair with an every day conditioner. LEAVE THE CONDITIONER IN YOUR HAIR and comb with a Denman brush section by section followed by smoothing the individual hairs. In the case of the looser curls, you can run your fingers through each section to define the curls. It’s a good thing too because it takes for-ev-er to define each individual curl. Plus, I prefer using my fingers over the Denman brush. Surprise surprise. My hair began to respond. I still had some damage from all the pulling but by golly it was starting to look a world better. The best part is I didn’t need to do a twist out or braid out to achieve it. NOTE: This post has been updated from the original published back in 2011. I’ve since stopped using the Tightly Curly Method and now I’m following a slightly modified version of the Curly Girl Method (aka The Method Where I Occasionally Use Silicones!). I also now do twist outs and braid outs to achieve elongated curls. My wash and go’s are less frequent since I’m seeking to reduce tangling and knots. Keeping my hair stretched in a gentle manner is my numero uno priority (as of the writing of this post). Have you tried the Tightly Curly Method to define your curls? Next PostWhere The Heck Have I Been? I had the same thing before when I constantly iron and change hair colors almost every week. They grow up long but dead and coarse end. I have several treatment on it but it looks as if they isn’t really working. Until one of my friends had advice me to use conditioner and apply herbal oil thrice a week. Ti’l this days I can see that it has revive my hair and make it more beautiful than ever. Hey Elane, thanks for your comment. It’s true. Plain ‘ole conditioner works miracles on dry hair. What’s wonderful is it’s so cheap too. When I first tried the Denman it ripped my hair out but then again I tried it on dry hair! So I figured I’d try it the way Terri recommends in the book – hair soaking with conditioner. I am SUPER CAREFUL and go very slow and it doesn’t rip my hair. But I can see how it would if I were to rush. What I like is it causes the hair to be very smooth but yes def have to have loads of conditioner. 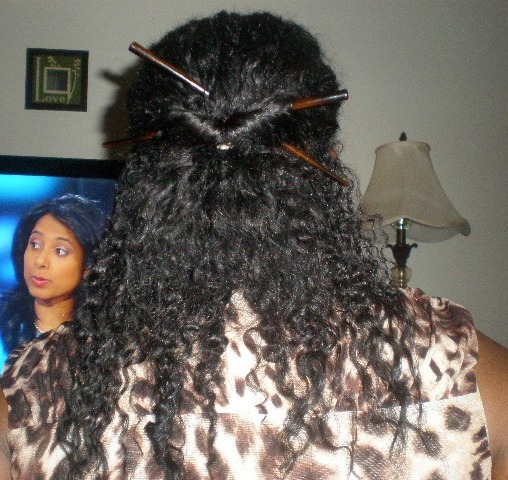 Also, I pre-comb my hair with my fingers so that reduces the tangling so the Denman doesn’t have to do much work at all. Also, when using the Denman, you have to work in very small sections. Do you use the Denman Michelle? I’m afraid of that brush … even modified. I used to leave conditioner in my hair all of the time because it made my curls look nice and stay moisturized. But, I haven’t don’t that in years. Maybe I’ll experiment a little with it to see if my hair will dry curlier. Nice post lady! gets the clumps going. It sits on my hair through the shower routine. I then rinse upside down in cool water and firmly scrunch in a small amt. of OneC. Get out of the shower, scrunch lightly with a MF towel, spray 2-3 shots of SIF over my hair, smooth over Angell and then scrunch it through. Flip upright, clip and diffuse. This gives me the most clumping of any product line and is how my hair is done at Devachan. You can mix ArcAngell and Angell together. I find ArcAngell gives me more curls and has far more hold but I don’t care for the crunchy feel in the wintertime. Like I said you can use any condish you like. The curls pop and clump from the squishing method. another method is the supersoaker method. You can find this on naturallycurly.com or youtube. look for ruddeechick supersoaker. This works well too. After adding the condish you use a lot of water. Water is key to clumping curls and getting good curls when you don’t have a strong curl pattern. Another thing you can do is add some gel and then rinse almost all of it out. then add your condish. 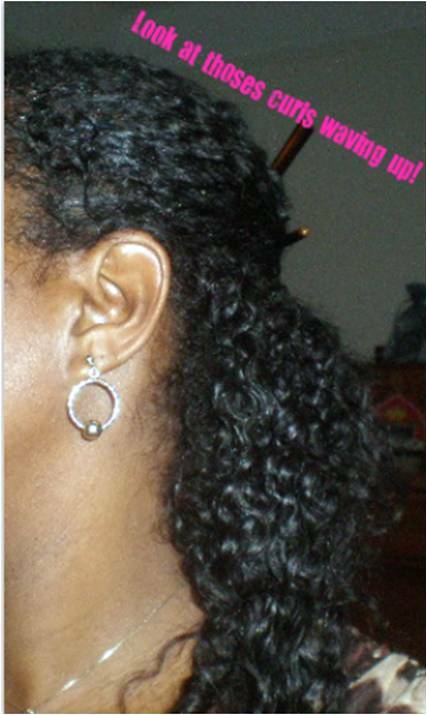 the gell will get the curls started and clumped even though you rinse it out. again it’s the water. HTH. Thanks for the tips Jackie. I don’t really want to use a diffuser though. I’m going completely heat free. when I define with the condish I find that all I have to do is rake my fingers though. Rinsing the condish out and adding more water will cause my curls to separate. It’s that condish that not only clumps the curls but also keeps them clumped when they dry. 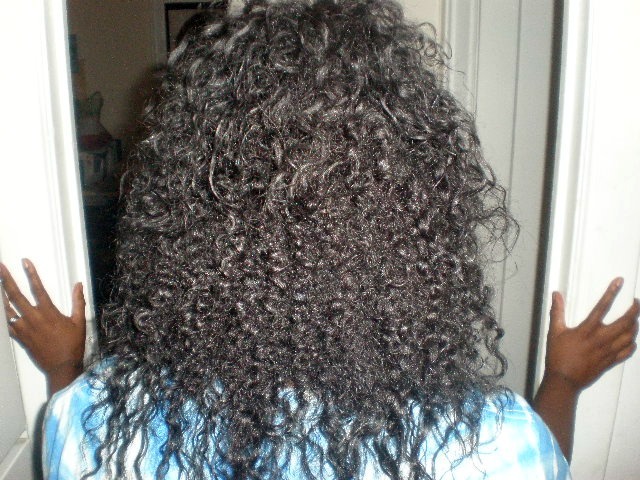 If I rinse most of it out then I have nothing to “weigh” my hair done to keep it from swelling. I’m pretty happy with this method and it’s so much simpler. I won’t do it weekly though because I am not always able to stay indoors. If I can’t stay in, I’ll just do a few twists and go. I like to keep it very low maintenance. All the scrunching and gel is too much for me LOL. I don’t like gel anymore either. I use aloe vera gel but it’s nothing like regular gel. I put it on to smooth my edges and then seal it with Jane Carter Nourish and Shine. That keeps my edges laying down when I don’t use conditioner to define. Thanks Etoile. It’s lasting about 4 days which is more than sufficient for me. I wash my hair about that often. GREAT POST! Your hair looks fab! Good review, you weren’t that bad. LOL!! The only thing about this method is walking around with a wet head. When are you suppose to do your??? I assume in the morning so that it can dry?? Oh, I didn’t say it would be bad. Well since I go to church on Saturday evenings I do it on Sunday mornings and I don’t leave the house. It’s easy then. If I’m going to need to go out on Sundays then I just revert back to doing a twist out. Your hair looks great! I have been using this method for a couple of months and it works really well for me. I use the Shikai Henna Gold conditioner to detangle and define my curls and it works awesomely!!! The definition I get using her method is ridiculous! Luvin’ it!!! I’m so glad I read Teri’s book. It has changed my perspective about my hair and I luv my curls! Thanks for sharing that Tani. I’m glad to have read her book also. I’m going to try that Shikai conditioner too because I think the Aussie Moist takes too long to dry. The Shekai Naturals (sp?) is a bit better but I want a stronger hold. Oh and yes to the SM Styling milk too! It leaves the hair so so soft.